Kristen Bell strikes a pose on the red carpet at the premiere of her new movie Like Father on Tuesday night (July 31) at the ArcLight Theater in Hollywood. The 38-year-old actress rocked a leather dress as she was joined at the event by her co-star Kelsey Grammer and his wife Katye. Fellow co-star Seth Rogen and his wife Lauren Miller – who wrote and directed the movie – were also in attendance. Also stepping out for premiere were fellow cast mates Zach Appelman and Paul Downs. Like Father will hit Netflix on August 3 – and you can watch the trailer here! FYI: Kristen is wearing an August Getty dress and Michael M earrings while carrying a Tyler Ellis clutch. Seth is wearing a full Etro look. 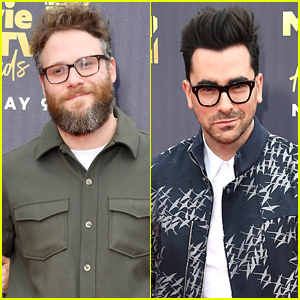 Seth Rogen & Daniel Levy Step Out for MTV Movie & TV Awards 2018! The 36-year-old actor was also joined at the event by Schitt’s Creek actors Daniel Levy (a nominee!) and Annie Murphy. FYI: Daniel is wearing Emporio Armani with Christian Louboutin shoes. Talitha is wearing a John Paul Ataker dress, Sam Edelman shoes, and Melinda Maria jewelry. Seth Rogen makes a fun appearance on The Ellen DeGeneres Show, airing on Monday (April 2), and dishes about his longtime relationship with Stormy Daniels! The 35-year-old actor and co-founder of Hilarity for Charity told Ellen that he’s been aware of her alleged tryst with U.S. President Donald Trump for about a decade. Later, Seth‘s wife Lauren Miller joins them for a round of “Pie Face” where Ellen gives them a check for $10,000 to their organization Hilarity for Charity, courtesy of Shutterfly – Watch more after the cut! Seth Rogen hits the red carpet for the 2018 Hilarity for Charity on Saturday (March 24) at the Hollywood Palladium in Los Angeles. 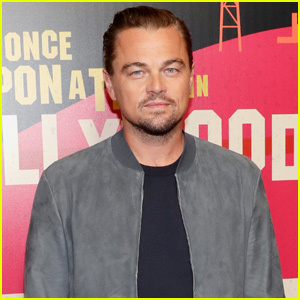 The 35-year-old actor was joined at the event by wife Lauren Miller as he arrived for hosting duties for the comedy event. Other guest at the event included Sarah Silverman, James Corden, Kaley Cuoco and fiance Karl Cook, Nick Kroll, Ike Barinholtz, Craig Robinson, Jon Lovitz, Jennifer Morrison, and Caroline D’Amore. Seth and Lauren launched Hilarity for Charity in 2012 – seeking to raise awareness about Alzheimer’s disease and fund care and research efforts. The special is set to premiere on Netflix on April 6. FYI: Kaley is wearing J Mendel with Stuart Weitzman shoes. Guests enjoyed pizza from D’Amores Pizza truck. Kristen Bell Wears a Wedding Dress While Filming 'Like Father' in Central Park! Kristen Bell looks ready to walk down the aisle in Central Park on Monday (August 28) in New York City. The 37-year-old actress was spotted in a white wedding dress in Manhattan, shooting a scene for an upcoming Lauren Miller Rogen-directed Netflix comedy, called Like Father. The show “centers on a workaholic woman who is left at the altar by her groom-to-be and winds up on her honeymoon cruise with the one person she thought she’d never see: her equally workaholic father, who left her and her mother when she was 5 because he believed family life was a hindrance to his career,” according to THR.